We were standing within the Salt Lake City Cemetery. 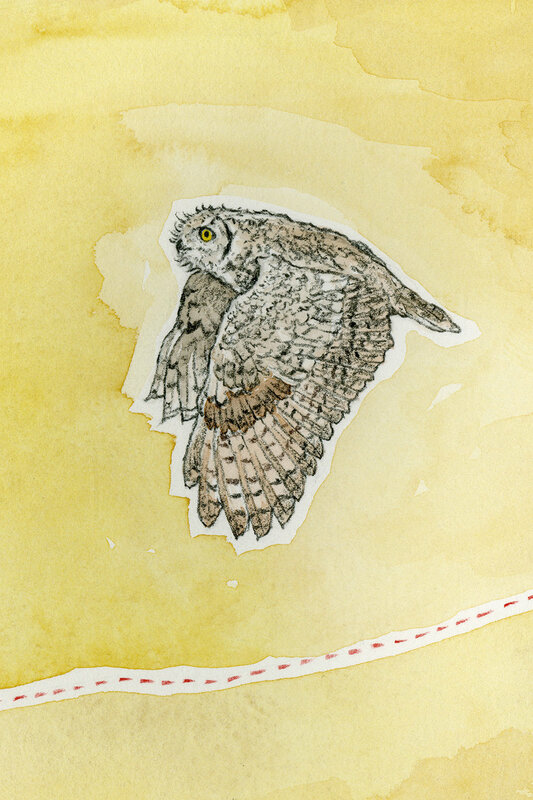 I had seen the owl before, and discussed the owl with other people. But the idea of the owl embodying the spirit of a dead human was a new and unexpected facet of the discussion. The woman, whose late father was ostensibly embodied by the owl of our discussion and observation, was Barbara. Well, I don’t know actually, I didn’t ask her for her name during our brief conversation and she didn’t offer it. But I’d like to think of her as Barbara. I’d like to think of the owl as being an observer of Barbara’s father’s funerary proceedings, that the owl was finding significance in the gathering that was lost on others. Perhaps the significance the owl found was merely its awareness of a mouse or a squirrel in the area, or perhaps the owl found that the crowd offered a brief respite from the cemetery’s ubiquitous magpies. The owl could have been aware of something else altogether that I would never understand; some underlying meaning behind why some of us live and die as humans, and others as owls. Perhaps this is a far too complex thought for an owl. But I don’t think it necessarily is—well, I certainly don’t want to think it is. “I’ve read that owls are thought to be connected with the spirit world in some indigenous cultures,” I told Barbara. “It’s that way in Hawaiian culture, as well,” she replied. It was evident that Barbara was a frequenter of the cemetery. She had many stories of its wildlife. I wonder why I hadn’t seen her before this conversation, or why I haven’t seen her since. No matter, it’s of no importance. What is of importance is what brought Barbara and me, two strangers, into conversation and mutual quiet observation: the owl, one half of the duo of Olive and Walt. Olive and Walt are the names that have been given to the pair of great horned owls who inhabit the Salt Lake City Cemetery. They make for a charismatic pair. Not by choice, but charismatic by projection from their many admirers. It must have been Olive that Barbara had seen at her father’s funeral years ago—Walt is too young. Situated at the corner of the Avenues neighborhood, and right at the edge of the foothills, the Salt Lake City Cemetery acts as a liminal space. It does so in more ways than one. The obvious being that it is a place where the living and the dead share space between their worlds. But, it is also a place where wild animals and urban humans share space. I used to only pass through, rather than visit the cemetery. 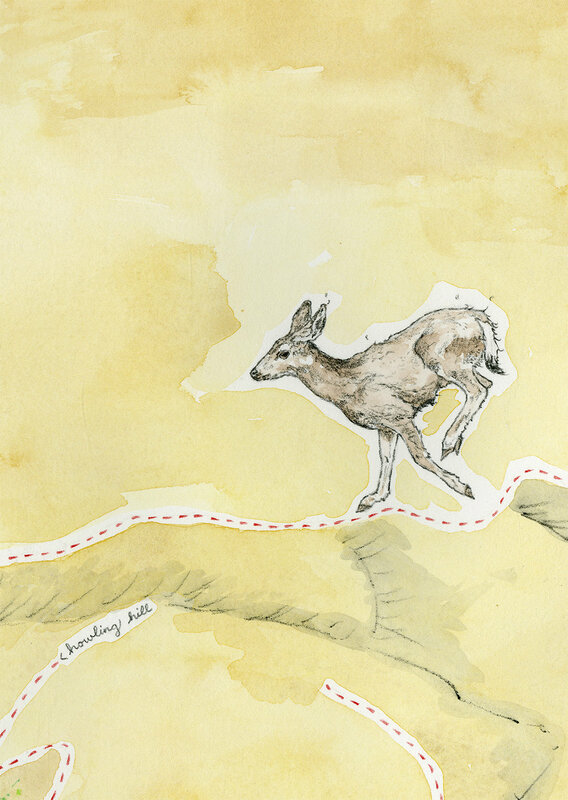 I used it as a liminal space for my own ends—to move myself from my home to the foothills, and back again, on my frequent runs. I run for exercise. I run to get away from my mental and physical urban and human life. I run to give my thoughts space to transition outside of myself. Running makes me feel as though I can bridge the urban realm that I come from, and the realm of the wildlife that I encounter in the foothills and the cemetery. The physicality of the run contributes to this feeling. The first owls I remember seeing I came across while running down the dirt trail that parallels the road of City Creek. City Creek is not far from the Salt Lake City Cemetery. On this occasion I tripped on a rock and fell while running. The fall shook me, which caused my mind to pause and think of my mortality, or at least my own safety. I let my old boyfriend Zach, whom I had been running with, continue on ahead. Soon after, at a then slower pace, I saw the owls. The first two swept by, fluttering awkwardly for a moment in front of me before moving on. The last paused on a branch and chirped while staring at me. I stared back. I did not know that owls made chirps. I had thought that chirps were the language of other birds. However, some owls are not above chirps, or at least not this particular owl. These three owls were also of an unexpected size. They were smaller than I had thought owls would be—perhaps the size of a kitten. A mature, alert kitten, if mature, alert kittens were rounder. I had no recollection of seeing owls before. This was perhaps three, four, five years ago; too long ago for me to remember if I waited for the owl to leave, or if I left the owl. The most frequent sound in the Salt Lake City Cemetery is the call of magpies one to another. The magpies own the cemetery. Or at least the magpies act as though the cemetery belongs to them. If the magpies do think this, I don’t mind. The cemetery certainly doesn’t belong to me, even though I like to think that I belong when I’m in the cemetery. And yet, despite their pervasive presence, the magpies are quite aloof when they want to be. And they want to be aloof most of the time. This in turn makes navigating my desire to be welcomed into their world difficult. Once, while passing through the cemetery on a run, I followed my intuition and took a route I didn’t usually take. I came across a one-legged magpie. The magpie took no notice of me. 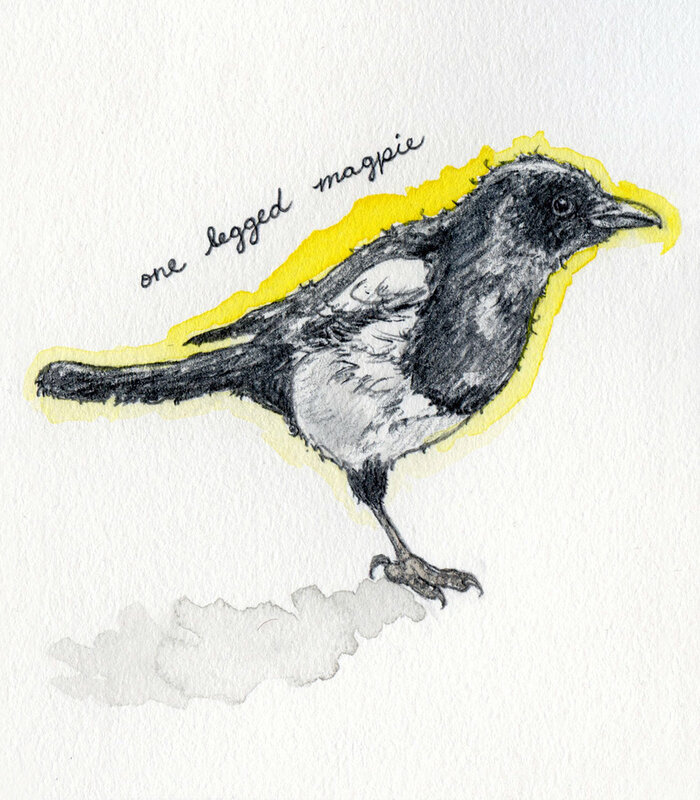 I wondered how the magpie felt about having only one leg. I wondered if she even noticed the leg’s absence. I wonder if the one-legged magpie would like her likeness. In late March I observed a single magpie standing on top of and staring down at a gravestone. He looked as though he were in contemplation. Another magpie watched the first. I am mostly sure they were not contemplating the grave, but only looked as though they were. This was a Wednesday, after 5:00. The cemetery’s groundskeepers had left; the other human visitors were sparse. I was interrupted in my observation of the two magpies when another magpie on the other side of the path began to produce loud noises. I turned to look at the source of the noise. The magpie faced me, cawed-cawed at me, and dramatically twitched her tail feathers. She didn’t stop. I felt affronted; it was as though I was being lectured. What for, I cannot say. On the same outing I caught the attention of a frenzied squirrel. The squirrel faced me and screamed as he dashed down a tree. He was likely reacting to the presence of the Cooper’s hawk that had landed in the neighboring tree. But following my interaction with the magpie, I was primed to feel as though I were missing a message that had been lost in translation. Prior to this scene with the squirrel, I had never taken the time to pay much attention to the squirrels of the cemetery. I had not yet found the interest, even though they are as prevalent as the magpies. I recently phoned my mother. She was out on a date in Highland Park. Highland Park is in upper Manhattan. I did not know she was out in a park when I called. I did not know she was on a date when I called. She engaged in conversation with me anyway. While in the park she had come across an abandoned tiny young squirrel. Worried about the squirrel’s wellbeing, my mother fed the squirrel and hoped that it would be okay. I don’t remember more details. I wish I did. I pay more attention to squirrels now. However, I do not draw them. Not often. I once saw a magpie brazen enough to pester either Olive or Walt (one of the two of them, I’m embarrassed to say I cannot easily tell Olive and Walt apart from one another). Walive did not seem to notice the magpie. I used to often see an acquaintance in the cemetery, an English professor at the university. He would take his son on bird watching walks prior to their dinner. The professor told me he had seen a flock of magpies hassling one of the cemetery’s owls as the owl perched in a tree. I don’t think the owls pay much attention to the magpies. I often go to the cemetery just to see Olive and Walt, although they don’t always appear when I expect them to. I hope they forgive me for expecting them to do anything. Really, I think they give no care to what I do. One time when I didn’t see Olive and Walt, I saw a hawk-like creature. It flew, and hawks fly, its legs dangled, and hawks have legs, legs that could dangle. It flew over my head, just as my head was headed home feeling the disappointment of not seeing Olive and Walt. I watched the probable hawk head to some far off destination. I had been hoping to see a hawk after talking to the English professor’s son. “It’s a blank blank hawk. 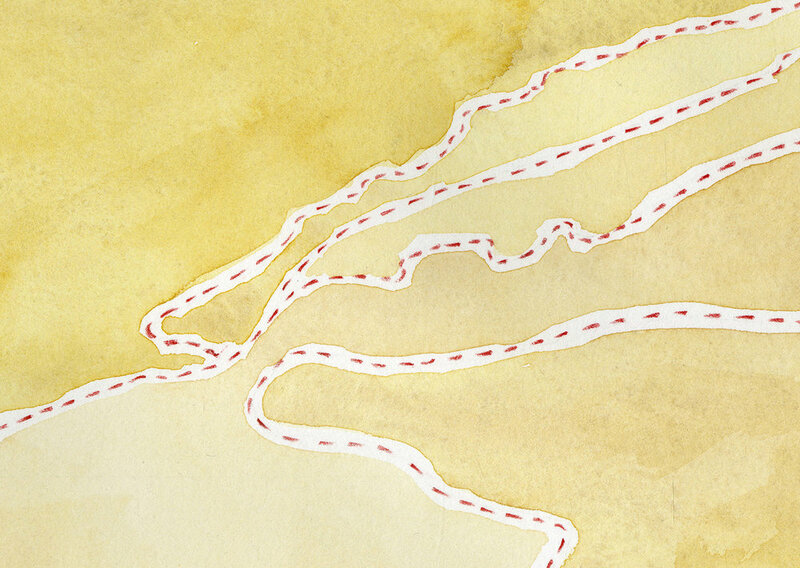 I saw a blank blank hawk.” He knew names of birds I had never heard of. He would mention them sometimes when I met him walking with his father in the cemetery. I don’t remember the son’s name and I don’t remember the hawk’s name. The lapse in memory does not mean I don’t care. I don’t remember when I first saw Olive and Walt. I do remember when I first saw Ruth and Arlo in the foothills. Ruth asked me if I had seen the owls in the cemetery. She told me they recently had babies. Baby owls. Arlo offered me a ride home. Ruth suggested I might want to continue running. I took the ride, along with the opportunity of having Ruth show me the owl nest in the cemetery. Ruth and Arlo are my human neighbors, neighbors to my home between the local university and the downtown. Ruth leaves town sometimes for her job. Her work is related to bird watching—in what way exactly I don’t know. Arlo once invited me over for a party he was having with his friends. It was not a formal invitation. He asked me over while he was on his porch and I was on my porch. I felt unequipped for his party. Arlo had his friends. And his friends had their string instruments and their yarmulkes. “We’ve got beer,” Arlo said, “or tea if you feel like it.” He went on calling over his porch, “My wife’s not home.” The string instrument bearing friends of Arlo laughed. I felt out of place; I felt as though I wouldn’t fit in at their party. Perhaps I should have joined. But I didn’t. I may have looked for birds instead. One week after I had seen the three small owls in City Creek, I came across two owls in the same canyon. They were the same size as the previous threes owls. And they chirped. One stood still, and the other jumped from branch to branch, tree to tree. Another week passed. I was on a run after dark in the Avenues neighborhood. As I passed a stop sign I was startled by a loud bong that reverberated from the sign. I turned around. An owl, again of small size, had landed on the stop sign. I stared. The owl stared. We both stared. A second owl glided between the two of us, touched the grass, and then flew up to a tree. The owl on the stop sign and I continued to stare at each other a few moments longer. I felt both overwhelmed and giddy. I was humbled and not humbled. I knew I would be seeing owls more. I began to expect it. I began to crave the otherworldly feeling I had in their presence. Usually I prefer to go out just before dark. Just at sunset. That is when Olive and Walt come out. And that is when the air feels as though it is picking up magic. Standing under the yellow, orange, and pink clouds of the sunset is when I feel as though I too can be magical. After dark is when I dance in the Salt Lake City Cemetery and no one can see me. I dance for the clouds resting on the horizon in the west. The clouds don’t dance with me, but I’ve never asked them to. After dark dancing is excusable. If someone sees you dancing in the cemetery at night it can easily be brushed away for reasons of one’s eyes not fully adjusting to the dark. One feels fancy after dark. Dancing should be excusable no matter the setting—or especially due to the setting. After dark is when I usually see Enzo on my way to and from the cemetery. Enzo lives at the gnome home. There are parakeets that live on the porch of the gnome home. The gnome home is red and Enzo is black. Enzo is a cat. Enzo makes one feel as though one belongs to his club. He runs down his path when he sees me coming. He presses his head into my hand, and I stroke his head and back. He sometimes smashes his head into my face. Enzo’s nose looks as though it has been flattened down onto his face just a little bit. I have yet to draw a picture of Enzo. I will. I will. Near the gnome home, on the way to the cemetery, there lives a crow. The crow uses the water that gathers over a manhole to drink and bathe. I wonder if Enzo has ever noticed the crow. If I could do such a thing, I would introduce them. Though, since Enzo is a cat, he might eat the crow. But I don’t think Enzo would try. Enzo does not strike me as a hunter. But he could be. He has his own life to lead. I was vegetarian for half of my life because I love animals. I stopped being vegetarian because I felt I needed meat after long runs. I justified my reasons to myself: the animals I love eat other animals I love. I realize this is a deceptive comparison. The animals I love hunt for the animals they eat. I do not hunt for the animals I eat. I am not prescribing anything. I reevaluate my decision often. During our short interaction, Barbara told me of an eagle and its baby that roosted within the cemetery. She also told me of a fox whose den was within the cemetery. I have never seen the eagle or her baby. I have seen the fox, although he eluded me for some time. Barbara was not the only person who told me of the fox. “I saw a magic fox,” Zach told me over the phone. Zach being an old boyfriend, this phone call took place a couple years after we had broken up. We broke up after seven years together. We were friends years before we dated. We were still friends after we broke up. We still told each other things we felt were significant. “I was in Lindsey Gardens,” he said. Lindsey Gardens is the park next to the cemetery. Zach told me that the fox appeared when he was hard pressed with a difficult decision. Zach said it was a magic fox, and that it glowed. He thought the fox was telling him something, assisting him with his decision. Sage, an acquaintance whom I run into frequently on the mountainsides that hug the Salt Lake Valley, posted a photograph of an arched silhouette of a fox on his Instagram account. The photo was magical. The photo felt powerful. The photographed fox’s surroundings were distinctly familiar: the Salt Lake City Cemetery. The photo has since disappeared from Sage’s account. I’ve looked for it to show others. I’ve looked for the photo to remember what Sage wrote about it. I couldn’t find it. I ran into Sage in the foothills. I asked him if he had removed the photo. He said he had. 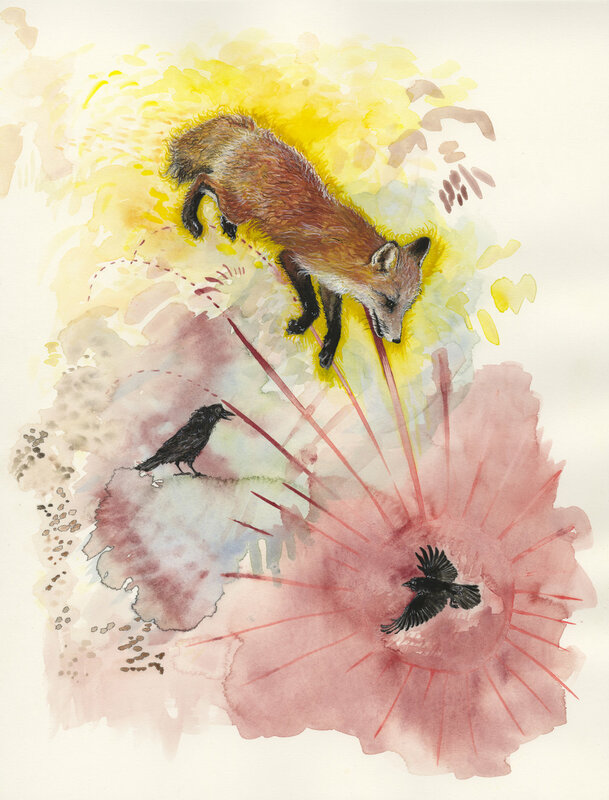 About a month before I saw the fox in the cemetery, I began painting a picture of the fox with crows—Enzo’s neighbor crow resting in the back of my mind. I questioned whether or not I’d ever see the fox. I once came across two beautiful owl feathers in the cemetery. I picked up the feathers. I wondered if they belonged to Olive or Walt, or to a nonresident passing owl breaching the lines of territories. The feathers felt powerful and it seemed disrespectful to take them. I left them. In November a professor asked to see some of my artwork. I brought my portfolio to her office. I draw a lot of owls. The professor became excited. She jumped up from her seat. “I have an owl feather,” she said. She found the feather on her shelf and offered it to me. I said, “No, thank you,” as politely as I could. I like to think that I respect owls. I don’t know that I understand them. I’d like to. 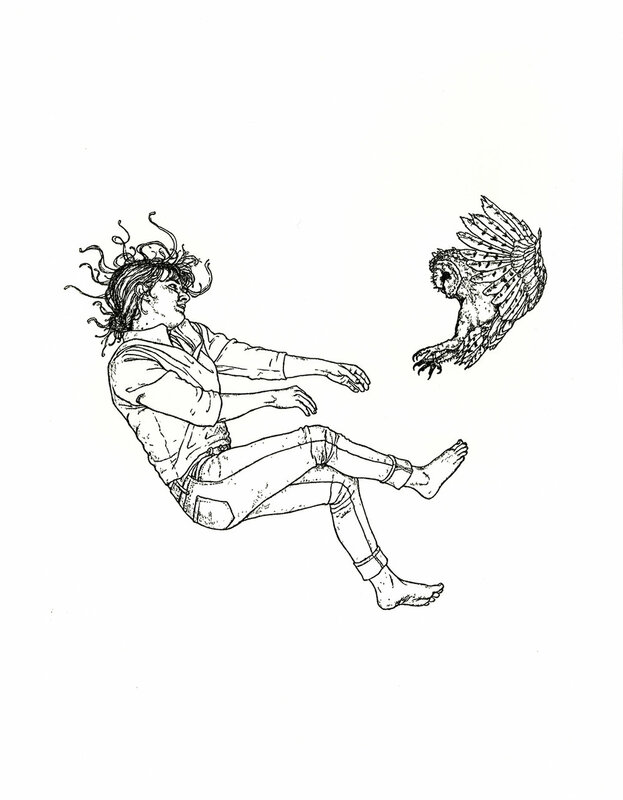 I like to think these feelings are mutual, so I drew a picture of myself floating with an owl. The other night I dreamed of an owl’s nest. I found the nest newly empty, prompting me to search for its former occupants. As I did, I realized I was being watched. A silent, nondescript female owl was perched in a small tree. In the neighboring tree sat another owl. This owl had three eyes. Later in the dream the three-eyed owl turned into a teenaged boy. The boy still possessed the owl’s third eye. I noticed that the third eye, positioned between the other two eyes, had a misshapen pupil. What did that owl and his counterpart boy see with that ill-formed third eye? Did the third eye compliment their vision or disturb it? I feel as though there is something I need to learn from this dream. I don’t always see the deer in the cemetery. They seem to appear out of thin air, startling me. They are always unexpected. This is a feeling that I do think is mutual. The deer come down from the foothills and mountains to eat the cemetery grass in the winter. Grass, a deceptively benign plant, has been the subject of contention for the cemetery. On a nighttime run in late March I came across a news truck parked in the middle western portion of the cemetery. The news reporter, a man in a white dress shirt and striped tie, was sitting inside the truck looking at his phone. Hoping I wouldn’t appear too strange or threatening, I approached the truck and inquired what was newsworthy. I was told that the grass within the cemetery had been accidentally sprayed with the wrong herbicide by groundskeepers last fall, thereby killing nearly half the grass. The reporter told me that he had been interviewing cemetery visitors on how they felt about the new patches of dead grass. “You can watch it on TV tonight,” he said. “Oh,” I replied. What do other people visit the cemetery for? Clearly not all visitors come for the owls and magpies. On the same night, I encountered an old woman walking in the cemetery after dark. As I passed her I said, “Hello.” She responded with a greeting, then immediately fell with her whole body flat on the ground. She moaned. She got up. She had white hair and wore an outfit of all white: white pants, white shirt, and white high platform shoes. Her behavior and attire were so bizarre that I thought for a moment I was witnessing the apparition of a ghost. After recovering from her fall, the woman told me that she had been speaking with her daughter about an old friend, and had then decided to come visit the old friend’s grave. She added that she had not expected to fall in a hole. I had not expected to see her. I am drawn to the cemetery for the owls and the magpies and the fox and all the others. However, the unusual human visitors also keep me intrigued. Who appears to be a nearly constant visitor is a man who sits in a blue car. I see him and his blue car on nearly all my visits to the cemetery. I’ve never had a good look at him; rather I see his silhouette in the car. I think it could be insensitive of me to get a good look at him. The blue car is always parked near the giant EXIT sign in the cemetery. The sign is painted on the side of the blue building where the groundskeepers keep their cars. One of the groundskeeper’s cars is decorated with a wrap-around image of a grim-reaper. This does strike me as insensitive. In mid-March, on a run through the cemetery, I watched the ground in front of me as I moved. When I looked up I saw a figure on the road ahead of me. Initially my eyes wouldn’t fully focus on the figure. My problem was due less to limitations of my vision and more to limitations of my expectation. The figure was the fox. His face was much whiter than I had imagined it would be. The fox must be old, I thought. I followed the fox up the road. He continued at a trot. He turned and left the road for a grassy hill where he stopped and sat to watch me. It seemed he was trying to determine whether or not I would continue following him. I suddenly felt as though I was being intrusive. I let the fox be and went elsewhere on my run, even though I desperately wanted to follow him. At home I reworked the painting of the fox. I painted white over much of the formerly red face. Recalling my meeting with the fox makes me feel almost as if the meeting occurred in a dream. In the Salt Lake City Cemetery is a mulberry tree. The mulberry tree grows in the middle of a juniper tree. It looks as though they are one tree. These two trees have created a liminal space between the two of them, a transition between one to the other, yet appearing to be one and the same tree. I eat the mulberries. I wonder if the magpies eat the mulberries. Does anyone else? In early April, while standing near the mulberry-juniper tree, I heard loud honks reverberating through the cemetery. As I followed the noise, a magpie rushed overhead to investigate the ruckus. We came upon a pair of geese honking while facing north. Never quieting down, the geese up and left heading south, carrying their honks with them. I wonder if they had heard about the magic of the cemetery and wanted to feel it for themselves. They had honked loudly and continually during their brief visit. Perhaps they meant to announce their presence to the owls and the magpies. I know at least one magpie was stirred, as was I, and as were three humans passing by. Digital storytelling example for Fulbright National Geographic application.